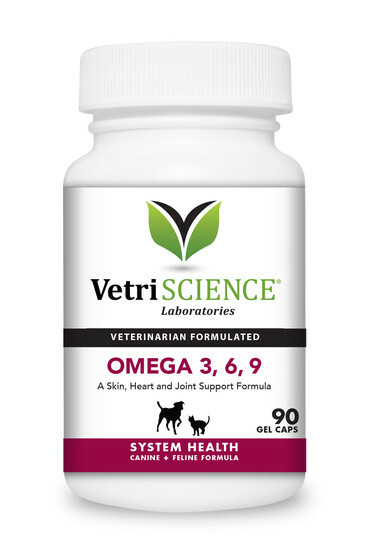 Vetri Science Laboratories’ Omega 3, 6, 9 is a blend of non-GMO oils from borage seed, flaxseed and fish. Omega 3, 6, 9 provides a healthy balance of fatty acids, which are critical to total body health, playing a vital role in the structure of cell membranes to support animals with skin health concerns, support the immune system, and support proper growth and development of the nervous system. Omega 3, 6, 9 provides a desirable ratio of omega 3 to omega 6 for more efficient and beneficial prostaglandin production. For easy administration, break open gel cap. If giving more than one gel cap, divide between AM and PM. All Cats: 1 gel cap every other day. Dogs under 15 lbs: 1 gel cap every other day. Dogs 15 - 30 lbs: 1 gel cap daily. Dogs over 30 lbs: 1 gel cap per 30 lbs of body weight, daily. Inactive Ingredients: borage seed oil, fish oil, flaxseed oil, gelatin, glycerin, purified water.